The third summit between China and North Korea in less than three months on Tuesday highlighted Beijing's increasing efforts to remain a key player in the fluid geopolitics of the Korean Peninsula and strengthen its hand amid friction with the United States, analysts said. 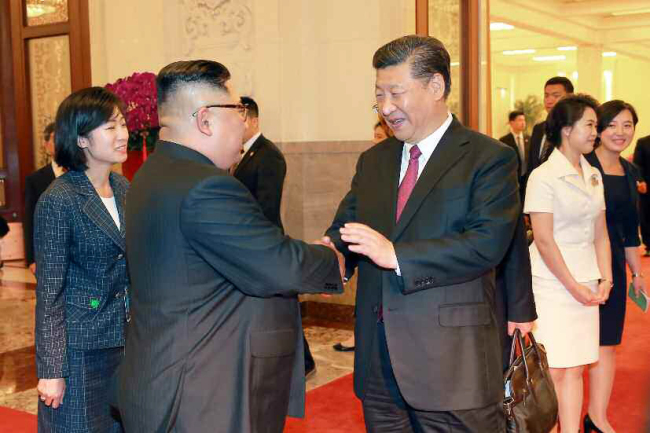 During the talks with North Korean leader Kim Jong-un, Chinese President Xi Jinping said their bilateral ties would remain steady regardless of situational changes, in an apparent sign of Beijing's will to keep its influence over Pyongyang. "No matter how the international and regional situations change, the firm stance of the CPC (Communist Party of China) and the Chinese government on consolidating and developing the relations with the DPRK (North Korea) remains unchanged," Xi was quoted by Xinhua News Agency as saying. The Beijing summit came just a week after Kim held a historic meeting with US President Donald Trump in Singapore, which yielded a vaguely worded statement containing Pyongyang's renewed commitment to the "complete denuclearization" of the peninsula. It is the third summit since late March, when Kim and Xi met for the first time, following years of estranged ties caused by the North's unceasing provocations, including its nuclear and long-range missile tests. China restarted its diplomatic outreach to the North ahead of the April 27 summit between Kim and South Korean President Moon Jae-in, in which they agreed to pursue a peace treaty to replace the armistice agreement possibly through a summit of the two Koreas and the US. The mention of trilateral talks raised the prospect of China being alienated or marginalized in a diplomatic project that could reshape the peninsula's geopolitics and lead to China losing its leverage over the Koreas. "What matters most in Tuesday's summit for China is to maintain its influence and role in the changing contours of security and geopolitics on the peninsula and in Northeast Asia, when the two Koreas and the US appear to be overseeing the change," said Kim Han-kwon, a China expert at the Korea National Diplomatic Academy. "Amid lingering distrust between China and the North, China could face a situation in which a dramatic improvement in US-North Korea ties could undermine Beijing's strategic interests over the peninsula," he added. The distrust between China and the North dates back decades. When Beijing opened diplomatic ties with Seoul in 1992, an isolated Pyongyang developed a deep sense of betrayal. That sense further deepened due to Beijing's lack of support during its severe famine in the mid-1990s. China's support for the biting US-led global sanctions has also exacerbated the distrust, prompting the North to explore ways to reduce its heavy reliance on the affluent ally to increase its autonomy, as well as to secure fallback plans for another rough patch. After Xi took power in 2012, the relationship between China and the North plunged to one of its lowest ebbs due to the absence of top-level contacts and Beijing's participation in the global sanctions regime. The shift in Beijing-Pyongyang ties triggered speculation that China started to recalibrate its policy toward the North, while Xi's leadership has apparently pursued a different foreign policy identity -- that of a great power rather than a developing country. Xi has sought a "new type of great power relations" with the US in a subtle shift from Beijing's long-standing strategy anchored in the virtue of strategic restraint -- staying low-key and biding its time until its clout matches that of its superpower rival. The pursuit of such a new identity led to a strengthening of Washington's pressure on China to become a "responsible regional stakeholder" to rein in a belligerent neighbor, the North. The identity issue besides, the North's relentless provocations have posed a major challenge to China's own security, when Beijing seeks to foster a stable external environment to focus on a raft of challenges at home, such as a slowing economy, income disparities and balanced regional development. The provocations have led to America's increased military presence, including beefed-up missile defense, and closer security cooperation with its allies, the South and Japan -- all anathema to China as it eyes regional primacy. Against this backdrop, Beijing has maintained its arm's-length diplomacy with Pyongyang. But that has changed as Kim launched a diplomatic offensive to blunt global sanctions and fend off the threat of US military action. Last week's unprecedented summit between Trump and Kim was apparently a source of strategic concern for China, as closer ties between them could raise the prospect of the North falling into the US orbit, analysts said. "For China, the North was a constant as the key ally, and the North has also been a buffer zone that precludes the advance of US troops in the South to its doorstep," Park Won-gon, a diplomacy expert at Handong Global University, said. "But the Singapore summit might have created a sense of crisis for China, or fear in the sense that the North could move into America's sphere of influence," he added. China's renewed engagement with the North came against the backdrop of intensifying conflicts with the US over a series of sensitive issues, including territorial disputes in the strategically vital South China Sea, trade and not least Beijing's "core value" issue of Taiwan. Thus, China could use the North as one of its bargaining chips in future negotiations with the US, observers noted. "The US and China appear to be dealing with the peninsula issue in the broad context of their strategic rivalry," Kim of the Korea National Diplomatic Academy said. The latest summit between Xi and Kim mirrors Pyongyang's "pendulum diplomacy" seen during the Cold War. Amid tensions between its communist allies, China and the then Soviet Union, the North swung between them in a balanced approach to maximize its strategic interests. Kim Dong-yeop, a researcher at Kyungnam University's Institute for Far Eastern Studies, said that the North appears to be seeking to build equal trust with both powers to generate opportunities for its regime survival and prosperity. "I don't think the North is playing one against the other. Trump is not a leader who would allow that to happen," he said.